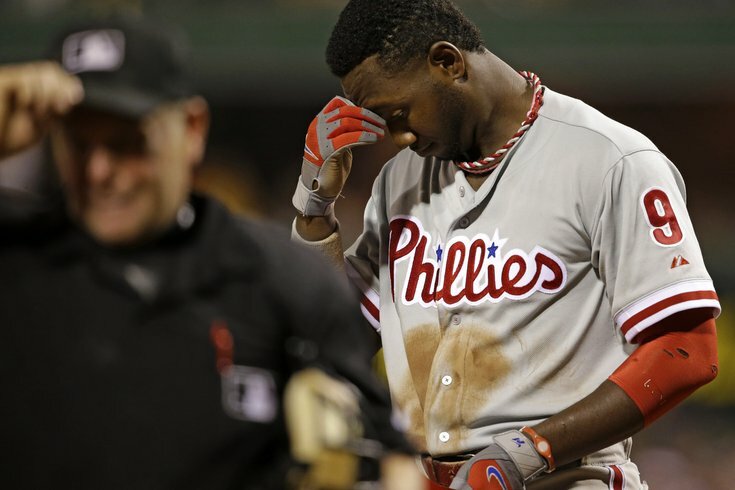 Domonic Brown reacts to striking out to end the eighth inning on a swing called by umpire Jerry Mealsin a 2013 game. Domonic Brown is a baseball player with five tools, and yet none of them can fix what’s wrong with him. Despite his undeniable talents, he can’t hit, can’t hit for power, can’t field, can’t throw and often chooses not to run. Oh, yeah. He also has a bad attitude. If you’re looking for the poster boy of the 2015 Phillies, he will be smiling smugly in the outfield again this season, a vivid symbol of squandered potential. At 27, Brown should be a bridge between the most successful era in the team’s history and the next generation of promising talent. Unfortunately, that bridge collapsed long ago. In fact, the only pertinent question surrounding Brown right now is why he’s still on the team. His production last year was pitiful: .235, 10 homers, 63 RBIs. Statistically, he was ranked the worst defensive left fielder in baseball, a problem the Phillies aggressively corrected in the off-season. They moved him to right field. The most amazing accomplishment of Brown’s big-league career is that he survived five seasons with the Phillies based on one month of star-level production. That glorious streak in May of 2013 won him an improbable spot on the All-Star team and has kept him in the big leagues long past his expiration date. Brown is lacking one essential ingredient in all truly successful athletes, the ability to think logically. He displayed this flaw again last week when he arrived at spring training and took on a role he clearly hasn’t earned, that of a leader. Despite his talent, he never developed. Despite a locker room filled with role models, he never learned how to act. Despite so many chances, he never became a star. “I want to make sure that everybody’s on the same page to do those little things to win baseball games,” he said. The man who made that statement walked 34 times in 512 plate appearances, had seven stolen bases despite being one of the fastest runners on the team and had one home run in 106 plate appearances against left-handed pitchers. The little things? Dom Brown needs to acquire two things, immediately. The first is video of last season, so he can study his own lazy, uninspired play. No one hustled less than Brown last year. You can check the tape. And second, he desperately needs a mirror. Never has he seen himself for the player he truly is – a delusional underachiever. The most discouraging comment made during the first week of spring training came from manager Ryne Sandberg, who has the impossible challenge of finding a way to revive Brown’s career. Oh, please. Brown will never be a piece of any puzzle because he is the puzzle. He represents everything wrong in the Phillies organization since their 2008 championship. Despite his talent, he never developed. Despite a locker room filled with role models, he never learned how to act. Despite so many chances, he never became a star. Four years ago, colleague Al Morganti and I had just watched Brown walk out of the broadcast booth at Bright House Field in Clearwater after an interview for our WIP radio show. We were both stunned by the obnoxious attitude of the next great hope for the Phillies. Al was right. Five tools are not enough if they lack the most important tool of all, a logical mind. With the mouths of the entire Eagles organization still clamped tight -– it’s 10 weeks now since Chip Kelly last spoke to us –- speculation is growing louder over whether the coach will make a bold move up the draft for his former Oregon quarterback Marcus Mariota. And now we have a juicy new nugget of information to chew on. At the MIT Sloan Sports Analytics Conference in Boston on Saturday, Howie Roseman made his first public remarks since losing his GM position, and all the personnel powers that went with it, two months ago. He was very clear on whether Kelly should take the plunge. Is it possible that Roseman’s philosophy was the reason he lost his personnel power? Did Kelly realize that Roseman would try to block any move up for Mariota, so the coach eliminated the problem by forcing Roseman out? Or is the timing of Roseman’s ouster, months before Mariota became available, just a coincidence? Coming in the same week when several major draft experts (Pat Kirwan of CBS, Peter King of SI and this website’s Jimmy Kempski) reported more evidence that Kelly is planning the big move, Roseman’s remark shed new light on the philosophical differences between Kelly and Roseman. In his two years in the NFL, Kelly has repeatedly downplayed the value of picks, while Roseman has treasured them. Kelly’s argument is that teams rarely know whether even the best college players will make the transition to the NFL. Unless, of course, a coach has already worked with the player. Kelly has worked with Mariota. Kelly loves Mariota. And Howie Roseman is no longer in the way of their inevitable reunion. Todd Herremans left the Eagles the same way he played for them over the past 10 seasons – with no fanfare. The rugged offensive lineman was not the kind of player who sold tickets or jerseys. He just quietly contributed a toughness that made everyone around him perform better. Earlier in his career, Herremans had meniscus surgery during the bye week and managed to miss no games; last season he played for two weeks with a torn biceps muscle, rendering him a one-armed player, because the line was depleted. He didn’t take one for the team; he took many. For most of his tenure here, Herremans was the coach’s best friend because he was so versatile. Ultimately, he played 71 games at left guard, 23 at right guard, 24 at right tackle and six at left tackle. Unlike his linemates, he never made a Pro Bowl, but his toughness was contagious. Herremans is no longer an Eagle, at 32, because of how highly former Eagles coach Andy Reid regarded him in 2012, when the lineman received an extension through next season that made him one of the highest-paid linemen in the NFL at an annual $6 million salary. Herremans is not an Eagle today because the numbers no longer made sense to coach Chip Kelly, who saved $2.8 million under the cap by releasing him now. Proud to the very end here, Herremans refused to restructure his deal. He is a tough negotiator, too. Since there will be no stirring eulogies at the end of his career as an Eagle, let’s just leave it at this: Todd Herremans was a very tough player who gave 10 years of dedicated service to a very tough sports city. He deserves our admiration, and our thanks. • Brett Brown could not hide the pain in his voice when he was talking last week about Michael Carter-Williams, the promising young point guard who was traded to Milwaukee last month for an unknown draft pick sometime in the future. Brown hated the move. It may cause him to quit soon. You read it here first. • The man inside the new Sixers mascot costume is not a Philadelphia sports fan. Before he got the mascot gig, Darnell Enrique openly mocked Philadelphia sports teams on Twitter. That’s right, kids. Franklin the Dog doesn’t like the current edition of the Sixers. In other words, he is a very smart dog. • Phillies legend Dallas Green let it slip last week that new president Pat Gillick is planning to run the team for this season only. Gillick is 77 and has already retired several times; he doesn’t need the hassle. But this news means both he and GM Ruben Amaro Jr., who is in the final year of his contract, could be gone next year. Does it make any sense to start a rebuilding project with two lame ducks? • The Flyers may not be winning the race for a playoff spot, but they are running first in the human race. The decision to trade Kimmo Timonen to Chicago and give him one final chance for a Stanley Cup was a rare act of humanity in a cutthroat sports world. And GM Ron Hextall’s trade of Braydon Coburn was an even bigger coup. • Keith Olbermann decided it was a good idea last week to belittle Penn State students right after they had raised $13 million for charity. Still harboring a grudge over the Jerry Sandusky scandal, the ESPN bully called the students “pitiful.” His bosses reacted by giving him a four-day paid suspension. Now that’s pitiful.